Basically, if functional from every point of view, as well as safe and beautiful, an outdoor kitchen becomes an additional living area. Furthermore, you should keep in mind that such a project significantly increases the value of the entire property, making it more attractive to the real estate market. However, even if the owner doesn’t intend to sell the property, the added value guaranteed by an ad hoc outdoor kitchen would result in exclusivity and luxury perceived by the owner himself as well as by his guests. However, for all this to happen, it is essential that the project is studied in detail. minimising the unexpected and any changes of course during construction, which often lead to irrecoverable mistakes or shortcomings. These details should be taken into consideration even more if the project in question refers to an exclusive and high-quality structure. Next, we will analyse which mistakes you should avoid when designing a luxury outdoor kitchen. This error mainly occurs because we tend to define the shape of the kitchen, then the space occupied by the outdoor kitchen, before even studying every functional part of it. The solution for overcoming this problem is to list the appliances first, then the furniture and accessories that you want to include in the project. Then you have to indicate the dimensions and especially the depth of each element. Next, consider the style you intend to give the kitchen from an aesthetic point of view since the overall dimensions may also vary depending on the materials used. Another important aspect to indicate in the first phase is the different work plans based on the functional areas in the project (for example, worktops or countertops in the hob area, in the grill area, near the sink, etc.). All these considerations as a whole will ensure a greater perception of the minimum dimensions to be considered in the development of the project. Outdoor kitchens need the same workstations as indoor kitchens. By carefully calibrating the spaces between the various stations, you will avoid "overcrowding" the work areas and consequent disorder. Among the most common errors concerning space, there is excessive proximity between the hob and the work area, as well as the lack of a clear separation between the cooking zones and the "colder" ones. Spacing out the two zones ensures greater comfort as well as greater safety. 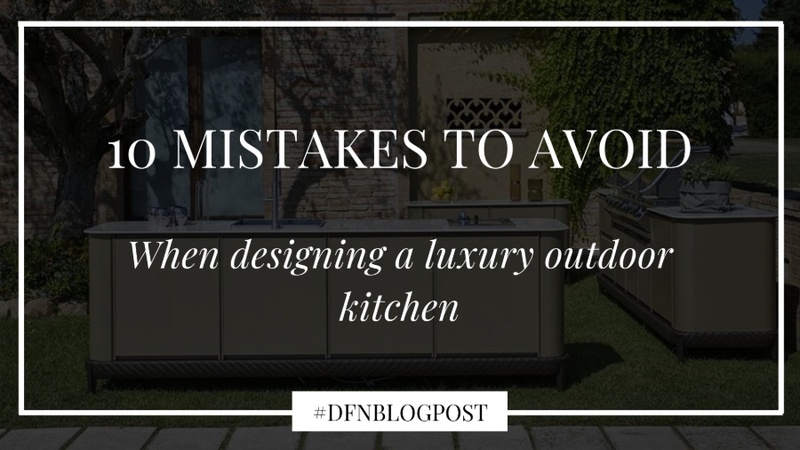 Not including a counter, where you can place food and ingredients, is another mistake you should avoid when designing a luxury outdoor kitchen. An outdoor counter is just as important as the one for the internal kitchen. Also, in the area destined for sinks, a space where you can set down ingredients and various utensils must be provided. As a general rule, therefore, it is important to provide a suitable workspace for each planned area. The space intended for storage is usually not as well designed as it is for indoor kitchens. However, even in the case of outdoor kitchens, it is essential to select specific furnishing accessories for the storage and organisation of tools, cutlery, plates and anything else necessary for food preparation. You could consider installing a real island that can add storage space as well as an additional workspace. During the design process, it is essential to take into account the measurements of the selected appliances to determine the right dimensions for the location of furniture and the worktop. If the worktop is made of granite, for example, or, in any case, a material that is customised, communicating the exact measurements to the supplier is essential to avoid having to repair it or find a solution on the spot. Furthermore, before purchasing the appliances for your outdoor kitchen, it is important to evaluate the specifications and verify that they are suitable solutions for outdoor use. Appliances not specifically designed for outdoor use should not be considered because there is no guarantee that they will resist the elements to which they will be subjected. Always talking about home appliances, it is important to define where they will be positioned. This aspect should not be underestimated in the design phase since the location of the appliances defines the final layout of the structure. Furthermore, it is necessary to bear in mind the importance of a clear separation between gas appliances or in any case hobs and refrigeration instruments. Among the mistakes to avoid when designing a luxury outdoor kitchen, there is indeed incorrect coating. Also, consider adding an insulating layer that protects against cooking flames. Which networks will be used now and in the future in case you upgrade the structure? Where will they be positioned and how will they be integrated into the outdoor kitchen? How will they reach the outdoor kitchen from the main house? First of all, you must consider the electrical connection. It is necessary to provide electric sockets for grills, induction fires, refrigerators or ice machines, but also for charging mobile phones, computers, tablets or even audio or video systems in case you want to set up an entertainment area. The water network is always a difficult subject and tracing new connections for an outdoor kitchen depends on both the property and the rules dictated by the municipality in which it is located. We are in an external environment, potentially livable, especially for parties and evening dinners. Therefore, lighting is essential and can often turn into a real challenge. For example, if the structure does not have ceilings, it is impossible to set up lights from above. You will have to compensate with floor lamps, suspension lamps or LED lights, perhaps at the edge of the countertop for an even more refined atmosphere. In general, it is important to include lighting solutions both for food preparation and, later, for their consumption. In this regard, considering the different phases of use of the outdoor kitchen, it is possible to install adjustable lights to decrease the intensity and create a softer atmosphere during convivial moments. There are different ways to design an outdoor kitchen. Regardless of how the structure will develop, you should not lose sight of the ventilation. The cooking area, in particular, requires air recirculation which is also important to avoid the accumulation of fumes. In this sense, it is advisable to provide a hood as well as study the direction of the wind. In addition, domestic appliances must be ventilated to prevent overheating. Furnishings should also have built-in ventilation grilles. 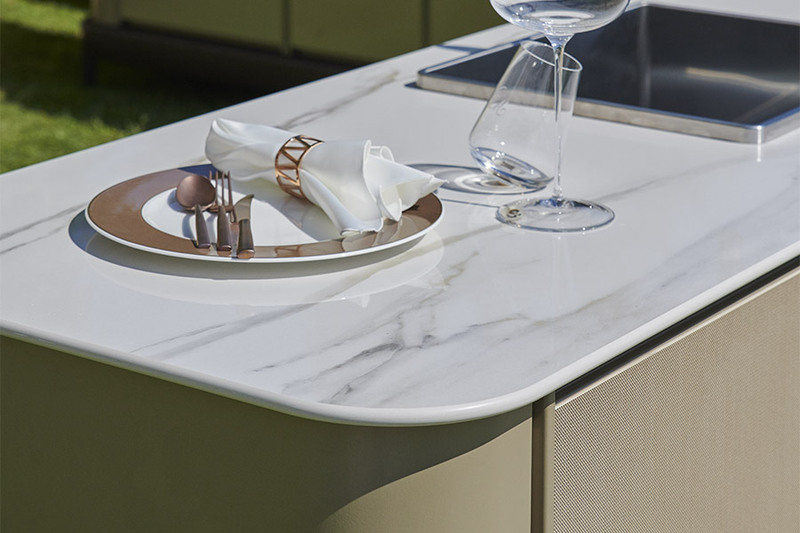 At the base of all the mistakes to avoid when designing a luxury outdoor kitchen lies the primary objective of ensuring that the client has an outdoor kitchen that combines fundamental aspects of aesthetics and above all functionality, an inseparable combination. 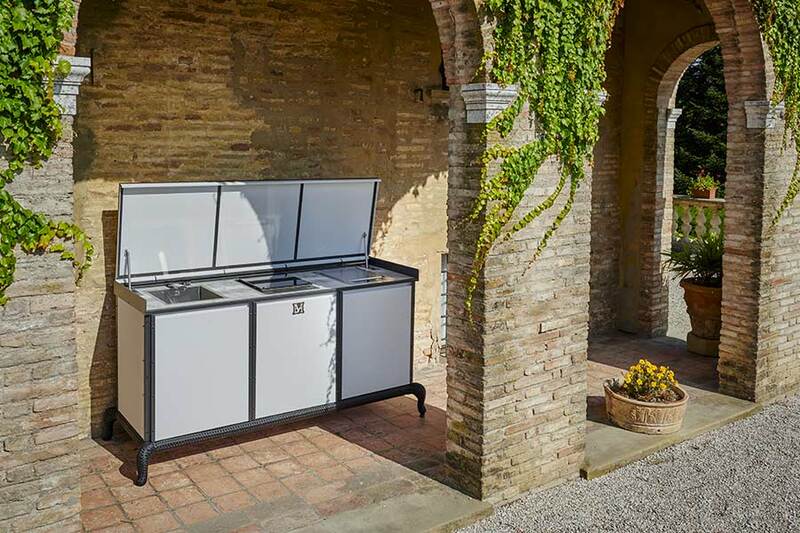 Focusing on design and accessories instead of functionality and practicality could result in an outdoor kitchen that has inappropriate and ill-thought-out dimensions, rather than a space that lacks essential characteristics for the use that you intended. For what occasions will the kitchen be used (grilling, aesthetic value, entertainment)? How many people will be hosted on average? Does the client prefer a structure adiacent to the main house or a detached area? 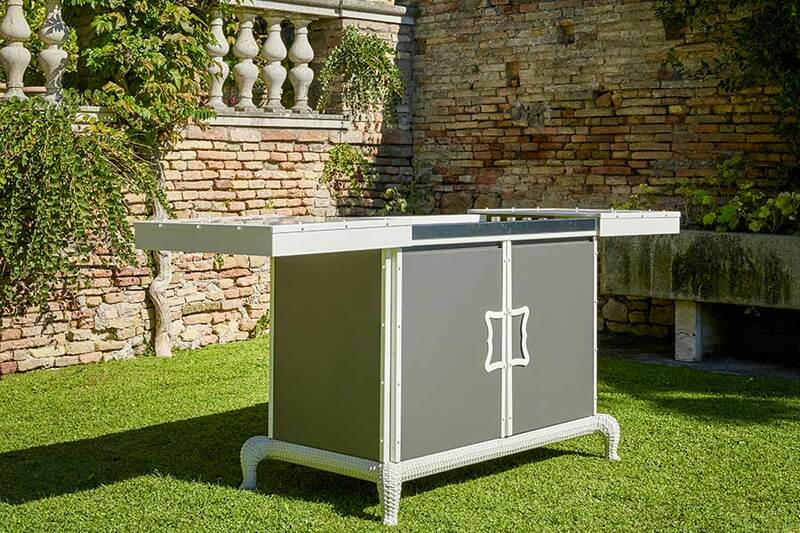 Responding correctly to these questions is decisive for the design of a luxury outdoor kitchen, impeccable in performance and stylistically inimitable.